FULTON, NY – Some east side residents were surprised Tuesday evening to find a black bear wandering through their city neighborhood. 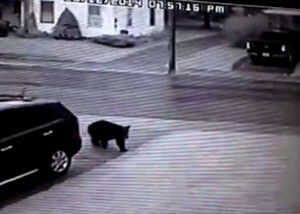 A black bear captured on surveillance camera in an east side Fulton residential neighborhood Tuesday. Fulton resident James Hutchinson said it was just starting to get dark and the black bear ran in front of him. He said the animal was about the same size as his 115-pound German shepherd. Fulton Police responded to the call in the 700 block of Cayuga Street and called the state Department of Environmental Conservation for advice on how best to deal with the bear. Officers kept the bear moving and when it reached a wooded area near Oneida Village Drive on the edge of the city it went into the wooded area. Hutchinson, project manager for the popular Trail of Terror Halloween attraction, said his neighborhood is right on the edge of the city limits. “But I’ve never seen anything like that in this neighborhood,” he said. It wasn’t until later that night he realized his home surveillance system had picked up video of the bear wandering along the sidewalk and driveway.